A-Mac & The Height represents a unique musical experience of unity and adventurous fusion of genres. With hook-driven songwriting and a cohesive blend of reggae, hip-hop, funk and alternative rock, the group thrives on overcoming musical boundaries. Their immersive message and feel good energy has proven to bring together beautiful people from coast to coast. The Denver, CO based band has a charismatic approach fueled by conscious thinking, with lyrics that are uplifting, relatable, and insightful. 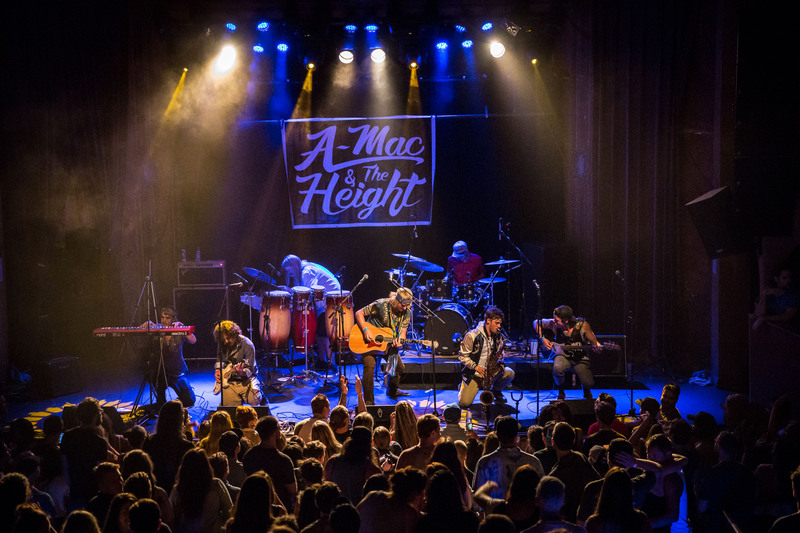 Bringing an energetic and moving live performance, A-Mac & The Height encourages their audience to partake in a genuine and united musical journey with them. Similarly, the group is known for creating intricate and extended musical passages through improvisation and faith in the unknown. In addition to fearlessly touring the majority of the United States within their first year of forming, the band has also put out two full length albums. Young, bold and determined, the group is fascinated with pushing the envelope of artistic expression, paying homage to many of the greats including Sublime, Bob Marley, Dr. Dre and Grateful Dead. After years of experiment and development, Alex Mackenzie-Low (a.k.a. A-Mac – Vocals & Guitar) has united his latest musical brotherhood, known as The Height. The band features six of Denver’s premiere musicians including Matt McElwain (Drums), Stephen Eski Edwards (Bass), Karl Rivers (Keyboards), Joey Bean (Saxophone & Vocals), Ted Kleist (Guitar & Vocals), and Jake Heym (Percussion). A-Mac & The Height continues to break the mold and expand impact over a wide range of music lovers. We just created our official group page! Compound Sound's lineup is looking quite tasty! Who's joining us 4th of July weekend for the festy vibes? A-Mac & The Height is in ... Comments Excited about this!!! That's a nice lineup Intimate Infinite Connect us to that gooooood vibration!